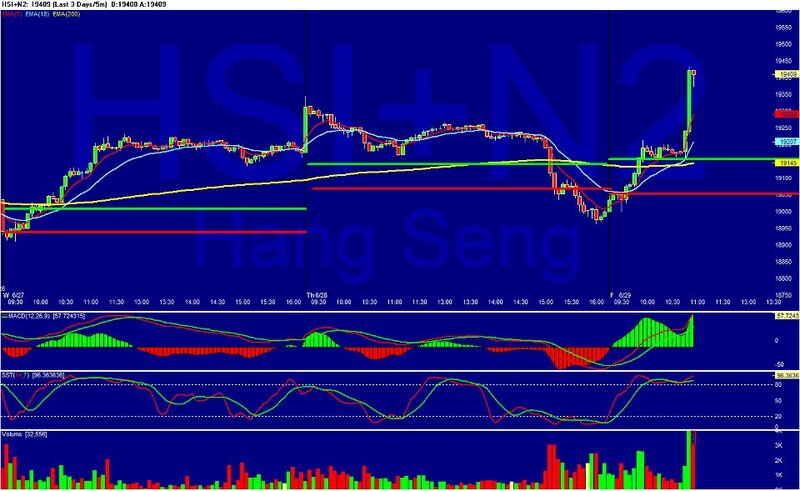 Testimonial by our Graduate who makes $ in Hang Seng futures again! 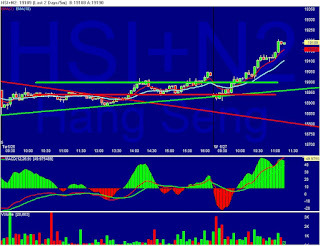 29 June 2012: Testimonial by our graduate Chin Hiong applying our "CASH RINGING SYSTEM" on Hang Seng futures again! "Hi Daniel, another typical application of Cash Ringing System. After 20 min charge through both box bottom and box top, it then tested 2 times the box top at 19157, it bounce off and hit a day high of 19529...amazing...trading tools..Cheers!" 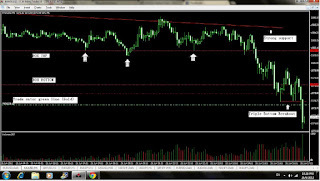 Testimonial by our graduate who makes $ in Gold Futures abd Forex trading! 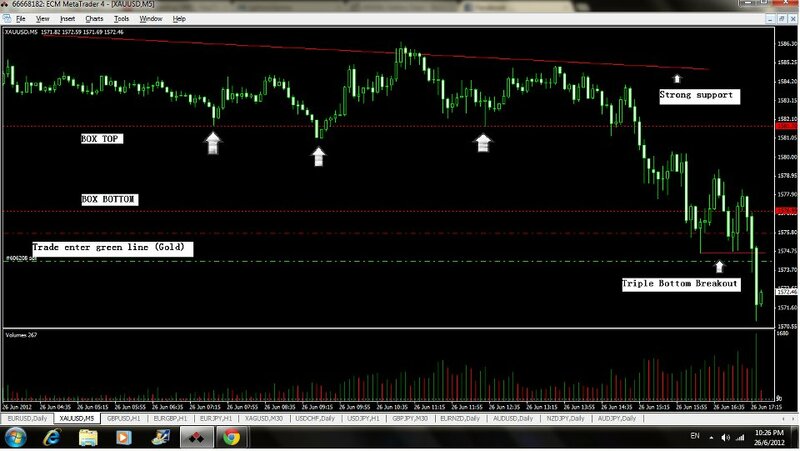 26th June 2012: Testimonial provided by our graduate Kah Meng - Making 50 pips in Gold Futures within 30 mins using our "CASH RINGING SYSTEM"
Take profit ad 50 pips within 30 mins"
Join us in our seminar below to know how Kah Meng did it. 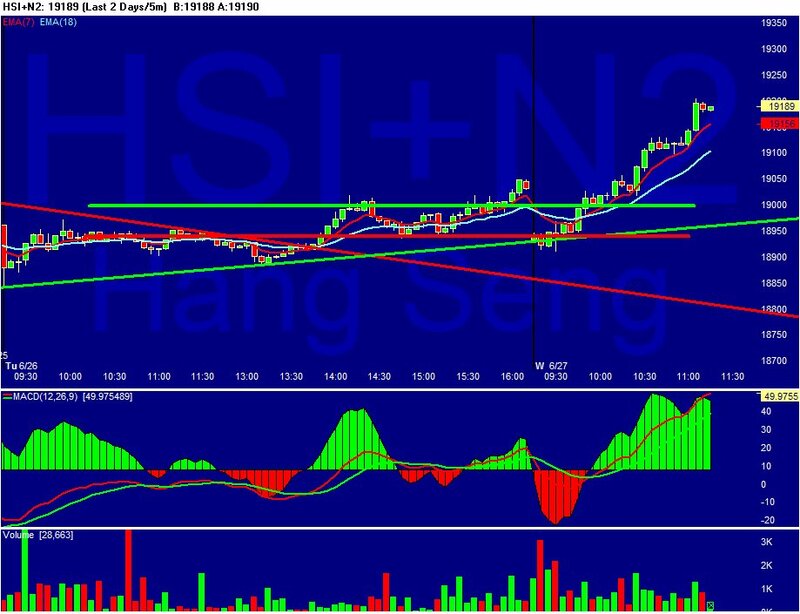 Testimonial by our Graduate who makes 200 points in Hang Seng futures in 40 minutes! Thank you very much for sharing the Cash Ringing System. 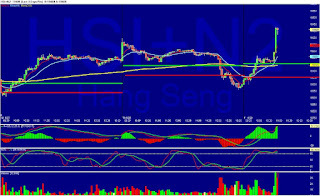 Applying it on the Hang Seng Index and it work very well. Box Top was 19000, Box Bottom was 18940. Once it stay above box top I bought at 19030 and took profit at 19220 was quite a run of almost 200 points.....just to encourage the rest and hope everyone in this group can give it a try...thanks again Daniel..Cheers!" 3) A Way to predict the market direction using 15 minutes per month. It has come to the crucial again. 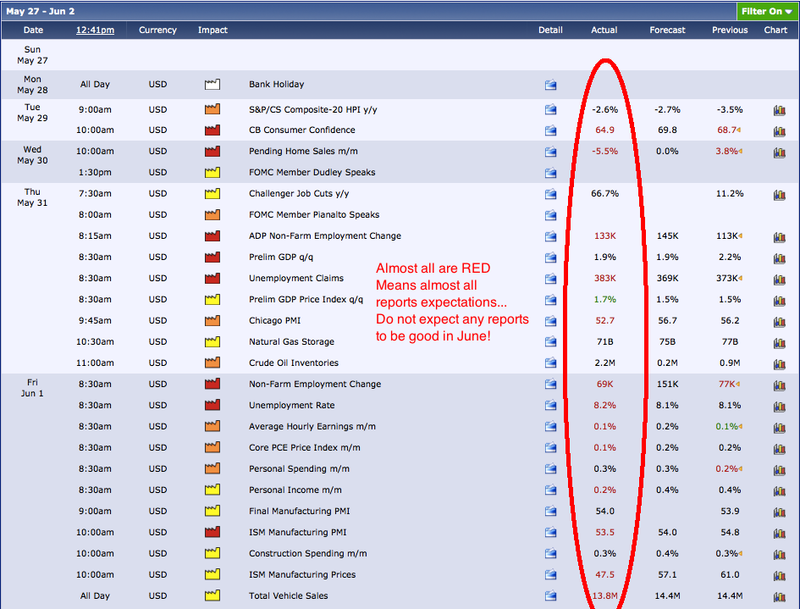 There is a glimmer of hope this Friday starting from the Chicago PMI report. It is a precursor to the important ISM report next monday. For June, ISM report is also a miss. Let us see for July, whether the enterprises fetch a better result. Next week is the HOLY week. Whether there will be a panic again will depend on the results next week. Apart from next monday's ISM report, we got to pay attention to next Thursday's ADP employment report, Friday's non farm payroll and unemployment rate again! After 3 months of disastrous, a total disaster in jobs results this quarter, we hope that July will spark a good start to the 3rd quarter. If the jobs recover, expect a recovery from the stock market as well. In fact, I am glad to say that July is earnings month again in US. This means that our eyes will focus more to domestic earnings results instead of worrying about Europe or economical reports shortfall constantly. We would worry more of IBM, Google, Exxon, Apple, Cisco, Wal Mart, Bank of America, Coca Cola etc. earnings! And that always meant not worrying too much of Europe or China. For Singapore stocks, earnings also start in July. But do take note of your portfolio stocks. Earnings is normally the time to pick up some good growth stocks and to get rid of those bad laundry stocks. Make sure you pay attention to your stocks. For speculators or short term players, one piece of advice is to sell your stocks before earnings. If your stocks are good, buy them back after earnings. As a trader, we do not like risk. The market always go against your prediction? Join us to Share and Discuss what is the next move. Come join us and find out more! 2. What are the strategy to use in next 3 months. 3. Shall I sell or shall I buy? Is market Crashing or will market shooting Up? 4. The full technical analysis of the current market. 5. Automated stock pick to find out the beat-the-market and underperforming stocks. My opinion is if you have the capability to hold stock, you may consider buying now. The worst it can get is that July may still fall if the ISM and Non farm payroll reports are bad. Even if it is bad, most likely, August will be the recovering month. With the US election happening in November, I just can't see the market falling 3 months before. US President Obama will likely "kill" FED chairman Ben Bernanke if that happen. And with August being the FOMC month, my guess is that some sort of stimulus will be injected to revive the confidence if July is bad. You might not want to wait till August as the stock price run-up might be earlier than expected. As it is tough to predict the bottom, my suggestion is that you can accumulate your stocks and wait for the final burst up till November. You need not pick the bottom. Do not be scared by any panics from now on. Treat EVERY single panic as opportunity to pick up some valuable growth stocks from now on! 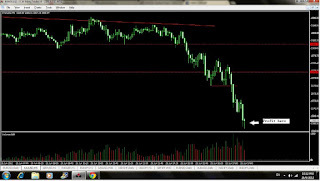 Anyway Dow Jones has dropped from the recent high of 13,338 points on 1 May 2012 to the recent low of 12,035 points on the 4 June 2012. We think there is a likelihood that 12,035 may be the lowest we see for this second half of the year. The worst would be that July's employment reports bring it to the 12,000 level again. By the way, Asian Leading Investment Guru Mr Hu Li Yang's 10-15% retracement theory indicates that in a Bull market, a stable index like Dow Jones will likely have a retracement of 10-15%. Once it retraces 10-15%, that is the opportunity to buy. This time round Dow Jones did not retrace 15% like what it did last October in the Europe uncertainty. But this round it did retrace 10% and bounce up after that. Our forecast of the market this 2nd half of the year remains bullish and we hope that you will not miss this tremendous opportunity to enjoy a possible run-up before US elections. If Dow Jones 13,338 is once again reached and broken, the all time high of 14,198 won't be far in sight. TIME to accumulate STOCKS as S&P500 and Tech stocks turn BULLISH! Our Market Sentiment Indicator has indicated that Stocks are turning Bullish in the S&P500 index and S&P500 Tech Sector and S&P500 Energy sector. Our indicator has been correct when it accurately predicted the Bearishness in the market in April. That is the start of the fall. Now it has turned as confidence has began to swing it around, though our NYSE and Nasdaq exchange stocks still remain bearish. I believe this turn in bullishness will continue, and once both NYSE and Nasdaq turns bullish, this bullishness will reach its full capacity. So now, I recommend buying some stocks to accumulate in preparation, both in US and Singapore. Risk is now low compared to April and May. Hopefully we get a positive news from Ben Bernanke tonight in the FOMC meeting. This will swing more stocks into the positive territory. 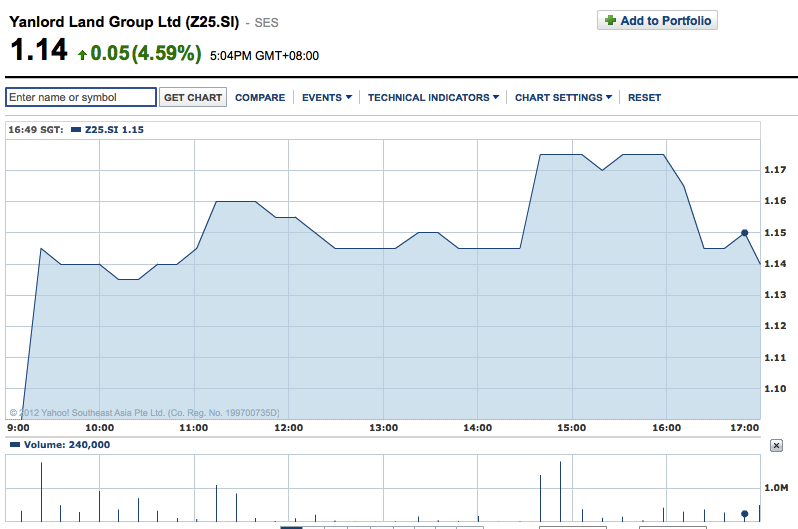 Today it isn't hard to see this stock going crazy! Timing is everything in trading. Hope you catch this stock too! It seems that it is a VICTORY for the Pro austerity party and European Union and EURO. Currently they have the majority votes. 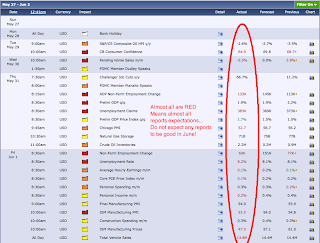 FOMC meeting on 19th June Tuesday: Will there be QE3? Last week rise is due to hopes of QE3 again. Market could not drop even when there is Greek election uncertainty. On Friday, Dow increase by triple digit again. Somehow I feel this week there will may great opportunity to go bullish! Let us get our CASH ready when opportunities arise. If Greece has nothing wrong on Monday, and if Ben Bernanke give some hints on Tuesday at the FOMC meeting, then it is a Bullish Play! By the way, somehow I have this feeling that some news may have leaked out about possible stimulus. Market has been so bullish that is seems quite unusual! But this is just my guess. Let us wait for the confirmation from the FED to see if any plans are in the pipeline! If there is, it will be pro stocks and Gold. Now I am watching CNN on the election. Tight fight now between the pro and antibailout parties. Perhaps a few hours later we have a result. Basically now the Pro is leading the Anti austerity party 31% to 25.5%. Currently the situation is that Greece could not form a government yet after holding the election the 2nd time. I also seem confused by the election results. The thing is there are so many fragmented parties involved. For Pro Austerity New Democracy Party to win, it needs the support of other party. They need to hold the majority votes. Polls showed the conservative, bailout-supporting New Democracy, with 27.5% to 30.5% of the vote and the left-wing, antiausterity Syriza with 27% to 30%, according to reports citing exit polls reported by Greece’s Mega TV. A slight edge in the final results is key, because the party receiving the largest number of votes gets an additional 50 seats in the 300-seat Greek parliament and giving it an advantage in forming a governing coalition. The first official estimate were due around 9:30 p.m. Athens time, or 2:30 p.m. U.S. Eastern. Voting ended at 7 p.m. Athens time, or noon U.S. Eastern. The exit polls appear to mirror results of the May 6 Greek election, where voters failed to conclusively back a new government that would lead them out of a debt crisis that has seen the nation flirt with default and shake the euro zone to the core. “If Greece goes any longer without a government, it could be worse off than if it just left the euro now,” said Jonathan Bristow of London-based Valbury Capital. The failure last month, which resulted in days of painstaking negotiations as the nation’s main parties scrambled unsuccessfully to form a coalition government, set the stage for the June 17 election. The vote was seen as a referendum on Greece’s current bailout and its strict austerity measures. Syriza has promised to reject the terms of Greece’s European Union bailout if it forms the next government. It’s rival, New Democracy, has sent signals that even though it won’t agree to the current austerity program in the agreement, it will eventually work out a way to find a deal after tough negotiations with the “Troika” made up of the European Central Bank, the European Commission and the International Monetary Fund, the three groups in charge of the Greece bailout. The outcome, however, could have far-reaching and potentially grave implications for Europe’s single currency. “It is not the election result in itself that matters,” said John Ventre, a fund manager at Skandia Investment Group. It is a litmus test that will give an indication of whether the euro zone can be held together, he said. 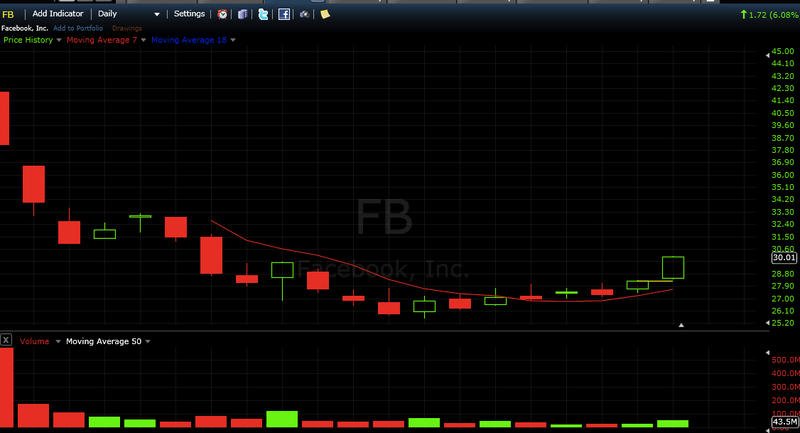 As you may know, I have been always negative about going into Facebook IPO. I mentioned to let it go bust before we enter. NOW however, I am turning bullish about this stock. 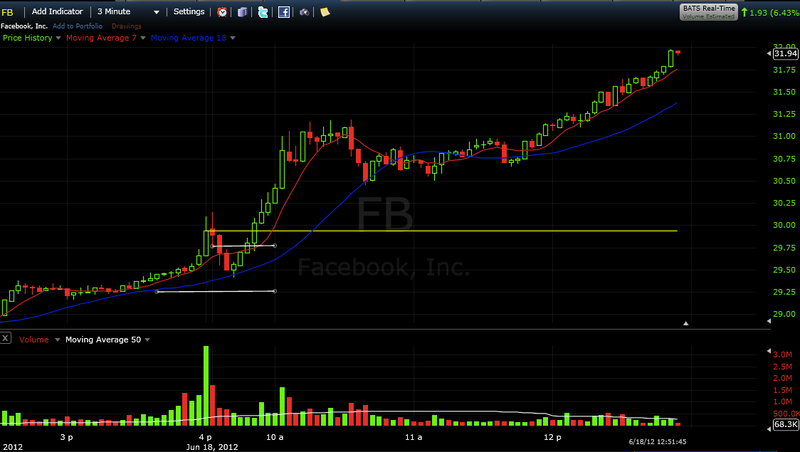 This is one stock that is hard to value but having been short down hard since IPO, I think it is overdone. These couple of days we have seen a strong upwards momentum shooting past $30 from a low of $25. This stock may be a long term play by buying its Stock. Or if possible, I am looking at its options for short term play. Did Asian Investment Guru Hu Li Yang predicted correctly about Europe? If you come for Asian Investment Leading Guru Mr Hu Li Yang's seminar last September, you would have heard about him talking about the Europe situation. 1 year later, his predictions do seem to come through. Last September, he urged all of us not to worry about the Europe crisis. It is in fact a golden opportunity to go into the market. Yes indeed, this January we reached a new high and we put the Europe crisis behind us. At that time, he mentioned that the stock market this year will continue to have potholes for us to fall into. "Do not expect a smooth sailing journey all the way to election. There will be bumps along the way." Yes indeed, he got it right again. Just when we expect Dow Jones to continue its 1st quarter's marvelous run, the 2nd quarter put a sudden halt to it. Europe's problems came back again. China's slowdown became a major concern which caused oil price, commodities, energy and industrial sector stocks related to China to decline sharply. All stocks related to China, no matter is it listed in Singapore or US, went down. Suddenly US also seems to be facing economical uncertainty with 3 months continuous shortfall in employment results. Even the famous fast growing BRIG nations, Brazil, Russia, India and China were forced to cut interest rates to save their economy. China being the latest to join in the crowd this month. Of course, will all these troubles eventually lead to a recession? Will Italy, Spain and Greece problems bring down the world? Mr Hu Li Yang does not think so. This problem will be solved. In fact Mr Hu Li Yang last year predicted how the Euro Zone will shape up. He even referred to Europe crisis like how the Romans fight the war in the past. When in war, the Romans did for once to tie up 8 horses together to enhance their fighting capability. Gradually they found out that though 8 horses did increase the capability, when one horse got shot down, it affected the rest of the seven. Mobility was compromised. Hence the Romans began to reduce to 4, later to 2. Mr Hu Li Yang said, "This is identical of the European problems. The way to solve it is to kick out the incapable nations. Those ill horses. One by one. Until the capable are left behind. He predicted Europe will do it within the next 2 years." Again, it does seem very likely now that Greece may be the first country. With this weekend election, we seem to have accepted the fate of Greece rest in the opposition. And it is no secret that the opposition do not want to accept EU terms and regulations. We are growing accustomed to the fact with each passing day that Greece might be out soon. Will Greece exit lead to a collapse in the European Union? I think Mr Hu Li Yang is right. The only best solution now is to eliminate the weakest horse. Only then will the Dow Jones reach its glorious all time high of 14198 points. After that strong psychological resistance, we might go on a super bull run just like what Prof Zeng Yuan Chang predicted. So let us pray and hope Greece exits fast!!! Market is so Boring it is better to watch Portugal vs Denmark match! I guess that is the same reaction in Wall street. The european bankers and traders and hedge fund managers may have tuned in to their TV like me. That is the reason that these few days the panic seemed to have subsided. I guess that is good news for the European economy as everybody in Europe engaged in their country's soccer performance. 2 weeks ago, this headline would probably cause a major panic in European and US market. Not today. I think market is more concerned about the match later in the week between Italy and Croatia. The Italians will probably be more concerned about being out of the competition should they not win. This is the market situation now. In the meantime, I am preparing myself for the match later between Holland and Germany at 2.45am Singapore time. Betting on soccer odds seem to entice me more now than betting on stocks. By the way, based on past historical records, just by following this indicator for the last 20 years, you would have avoided all US recessions or bear markets. This is a stock that our graduate has mentioned. Let us study this stock carefully. Yanlord may have reached a resistance at the "Law of Gravity of Price" of $1.20 after our friend, Chin Hiong mentioned that he bought it at $1.04. 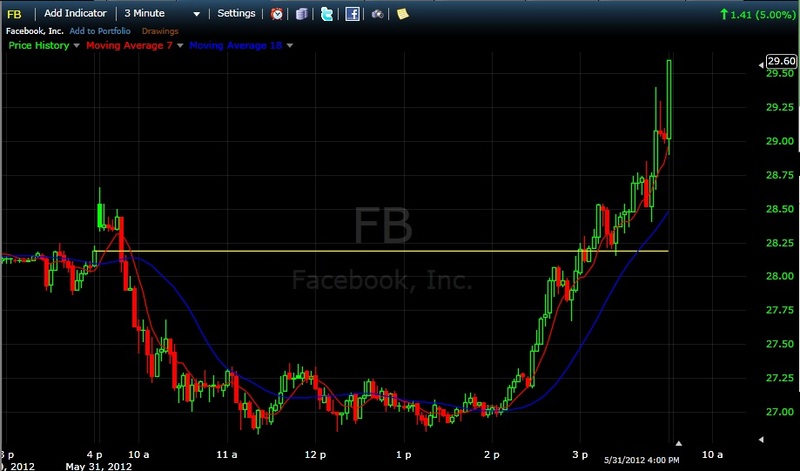 Did you see a lot of people selling at $1.18, a spike in volume intraday? Not a good sign today. Temporarily a rest is needed now. But can we look at this stock again in future? Yes, preferably when it comes back up to $1.19. I would normally prefer for this stock to go beyond $1.23. But for speculators, you may want to get in earlier. If at $1.20 it still has a resistance, please exercise your stop loss at $1.15. 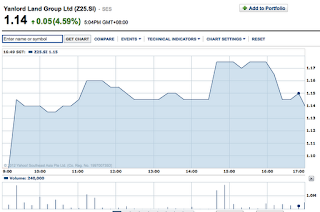 Do you remember us recommending Starhub ever since its upward move from $2.90 when it broke out? Our last article of this stock is in end of April where we mentioned that this stock is still strong. Indeed the highest it has gone is $3.30, which is what we called the "Law of gravity of Price". Today it ends at $3.29. Let us see if this stock can go past $3.30. If it can stand above $3.31, it might have a chance of travelling towards $3.40. The thing is this is a high dividend stock. You might consider owning it for defensive play. Plus a sharing on June market Outlook and Stocks Review! Is small start-up capital your drawback from start trading for your income? Is a correct predicted bear run always stop from earning money from the market? How to profit consistently using CFD? How to access a wider range of markets today, including indices, ETF and more? How to magnify your trading value to achieve a higher potential return? How to Profit no matter if it is a rising or a falling market? How to use CFD to hedge your portfolio using pair trading method? Our S&P500 Energy Sector Market Sentiment Indicator has shown a double bottom in the Oversold region. Currently 26.19% of stocks are bullish in the Energy Sector. We think that buying into Energy stocks now is a good choice as further downside is limited. Holding period can be mid to long term. What is the plan now that Spain has reached a resolution? Last night Spain stage its contest with Italy in the Euro 2012 football match. It has been delighting to know that with the kickoff of Euro, it seems that Europe problems has died down as media focus is channeled to soccer matches rather than focusing on its domestic economical problems. It is delightful to watch Spain's prime minister escape from his country to go to support Spain after getting 100million Euros. As a matter of fact, I think this is a smart political move to indicate that the Spain prime minister is still ENJOYING LIFE. It is as if he is saying "Relax everyone, let's just watch some soccer. The problem is over." This month is indeed a very unusual month that I find it hard to comprehend. But so far, like what I mentioned, once Dow goes up for 3 consecutive days and when Dow increase by more than 100 points, the temporarily trend has changed bullish. See our article 2 weeks ago when we said these are the 2 indicators to look for. On Thursday, Dow completed its 3 days up move. So it may just be going a bit bullish now. But be careful with your position size also as this weekend we will have GREEK Election also! Spain on Saturday became the fourth -- and largest -- of the 17 countries that use Europe's common currency to request a bailout. This is a big blow to a nation that a few years ago took pride as the continent's economic superstar only to see it become the hot spot in the eurozone debt crisis. Its economy is the eurozone's fourth largest after Germany, France and Italy. Although Spain has not yet said how much money it would seek, the Eurogroup -- finance ministers of the 17-country eurozone, of which Spain is a member -- said in a statement Saturday that it was prepared to lend up to 100 billion euros. The funds, which will come from one of three pools of emergency financing eurozone countries can access, will be sent to the Spanish government's Fund for Orderly Bank Restructuring (FROB), which would then use the money to strengthen the country's teetering banks. Across the country, Spaniards reacted with a mixture of anger and relief to the news. The full amount of the eurogroup's lifeline amounts to 21,000 euros of new debt for each person -- almost equal to the average salary in a country of 47 million where the unemployment rate for those under age 25 is 52%. The country is already reeling from deep austerity cuts Rajoy has imposed over the last six months that have raised taxes, made it easier to hire and fire workers, and cut deep into cherished government programs, including education and national health care. "It's obviously a shame," said civil servant Luisa Saraguren, 44, as she strolled on a sunny Sunday morning with her young daughter. "But this bailout was fully predictable, and the consequences of this help are going to be a lot bigger compared to the cuts we've been living with already." Rajoy took pains to avoid the word bailout Sunday, saying Spain's rescue package is a line of credit that its most troubled banks will be able to tap. The assistance will not come with the outside control over government macroeconomic policy like that imposed Greece, Ireland and Portugal when their public finances were bailed out. He said interest rates on the loans will be considerably lower than the rate near 7% that Spain has been forced to pay recently on the international debt markets, a level that forced the other countries to seek bailouts. The government will be responsible for collecting repayments from the banks, with interest, and returning the money to the Eurogroup, although interest rates and loan duration details have not yet been revealed. German Finance Minister Wolfgang Schaeuble said Spain's debt-to-GDP ratio was more favorable that even Germany's, with Spain at 78% of GDP and Germany's at 82%. "Spain is making the necessary reforms to improve its competitiveness and to limit its fiscal policy to a sustainable deficit. By the way, Spain's overall debt (ratio) is lower than Germany's," Schaeuble said. The bailout also spurred Irish opposition finance spokesman Michael McGrath to criticize his government for not having negotiated better terms, saying it needed "to start fighting Ireland's corner in a more vigorous and forceful way." Spain hopes to regain the economic credibility it has lost by shoring up its banks. This should result in credit being restored so businesses and individuals shut off from loans can start borrowing and the economy will grow again, Rajoy insisted, again without saying when. Europe's widening recession and financial crisis have hurt companies and investors around the world. Providing a financial lifeline to Spanish banks is likely to relieve anxiety on the Spanish economy -- which is five times larger than Greece's -- and on markets concerned about the country's ability to pay its way. Spain's government will make a formal approach for aid once independent audits of the country's banking industry have been carried out. It is not yet clear whether the money will come from the EU's 440 billion euro European Financial Stability Facility, the new 500 billion euro European Stability Mechanism, or a combination of the two. The deal is to be underwritten by the Spanish state, which will use the FROB as its mechanism to funnel the loan to banks in need. Opposition leader Alfredo Perez Rubalcaba said he had discussed the loan with Rajoy and added that for it not to increase the national deficit the entire amount borrowed will have to be paid back to the treasury by the banks, "including the corresponding interests." Economy minister Luis de Guindos said 30% of the banking system needed recapitalization. The IMF in its financial stability assessment report said, without listing names, that Spain's two large internationally active banks "are well diversified." It is understood that these are Banco Santander(STD) and BBVA(BBVA). and liquidity support" and that other medium and small private sector banks which account for approximately 11% of domestic banking were also exposed to the real estate and construction sector. Today after Big Ben's testimony talk, the market goes down a bit. But it hangs there. Now at 2pm EST, market goes back up to triple digit. Today we got a surprise cut by China in interest rate which is certainly a booster. Unbelievably, Dow Jones have risen for 3 consecutive days, and by triple digits for yesterday. Maybe 2day will be one. It has almost erased this month's drop so far. Quite a remarkably volatile month so far. 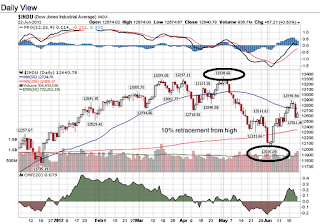 So far this rise is difficult to explain using technical analysis especially after S&P500 drops below 200day MA. Remember the whole world shouting BEAR just 3 days ago? What about hedge fund dumping their shares or the trigger stop? None has happened so far. I like to study fundamental economical data to know the direction. Do still take note that this month's economical data should remain weaken than estimates. And 2moro is Friday, expect some profit taking after this strong run these 3 days. Why is Learning Trading one of the hardest business? We normally like to disobey rules, rules of money management or emotional control. We always think we are right. "We think that this stock will surely rise" "We think that we should put in all our money to buy." In fact in trading 70% of the time we are wrong. Especially for beginners, who has not yet developed the intuition to trading. That is why we have money management rules, we have position sizing rules. All these rules are laid down by trading gurus because they have lost enough. We should just follow them instead of thinking we are always right! In everyday life, we are taught to act immediately so as not to waste time. This is the one of the worst habit in trading. To enter just because we could not stand ourselves wasting time looking at the screen. As a trader,we got to get use to a carefree life, a life where we do not need to rush into a trade, the act of waiting for the right time to come, the right day to come before acting. Think like a sniper, who can camp for days just for that one shot! That one shot (or trade) may be all it needs to earn 2 month's income. We are also taught in life to grab hold of any opportunities. We always live a life of scarcity instead of abundance! We always think that once we miss the chance to buy APPLE, it is gone forever. This is the chance of a lifetime. It is my only chance to be rich. Wrong thinking! Everyday or Every month there are chances in the market. There will be another Apple coming if you miss it. Live in the Law of Abundance. That will prevent you from going into a hasty trade and chasing new high. Nobody likes to lose in life. Especially a beginner in trading. We are so afraid of losing money that we forget our stop loss. We hope that the stock will rise back, which only happens sometimes. We do not face up to failure or losses. When we lose money, we switch off the computer instead of studying the reasons behind the losses. We are too afraid to lose! As a trader, we should like losses, adore losses and hug them. It seems an irony that I said it. But yes, after 10 years of trading, that is how I feel one should be. Lose MORE but SMALL. Win LESS but BIG. In sales, we often have a term called puppy close. Meaning if a pet shop owner wants to sell a dog, the best way is to lend the dog to the customer to take home for a day. This is one of the of the worst habits a trader should have. Thinking unrealised profit is PROFIT in the pocket even before closing your position just because you own it. A lot of us think that open positions in stocks with profits are already inside our bag which often is not the case. Open position means that the profit you have is still the market money unless you take it off the table. Traders should take the money off the table before they think it is theirs. The first thing once a trader has some unrealised profit, is to put a stop loss at breakeven. 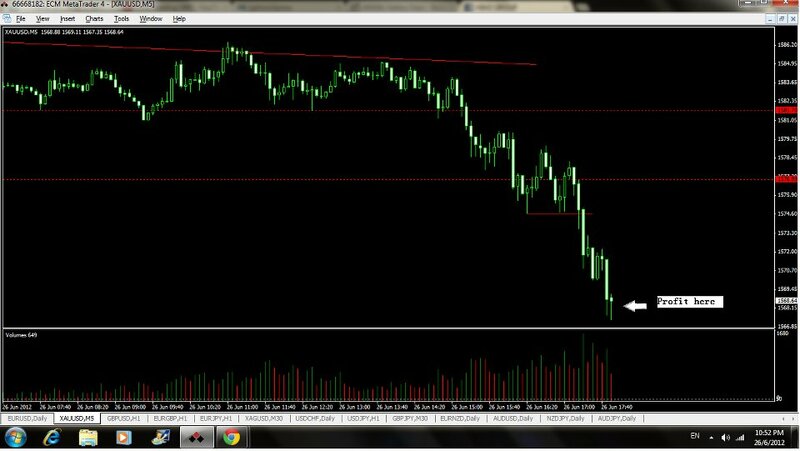 When market suddenly swing against us, get out at breakeven. Only by thinking that unrealised profit is not profit yet, will we be able to have the heart to do it. Often times we are slow in getting out of profitable trades when market suddenly swings is because we hope to earn back the maximum profit that think we had. Best Up Day in Dow Jones this year but should you jump in? By Midday today, Dow Jones is up by 215 points now. The reason for this rise is because of anticipation of QE3 ahead of Ben Bernanke testimony tomorrow. All sectors seem to be up. Advance stocks beat declining stocks 76.5% to 15.3%. This is a huge rally. It is the best day for Dow this year. Yes a lot of us may jump into the stock market. 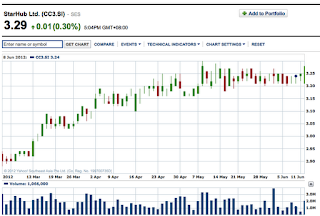 I guess tomorrow STI will open at a high, with a lot of stocks in the green. Maybe a lot of Singaporeans will jump in 2moro. However like I mentioned in the last article, I encourage you to exercise position sizing control. Make sure you put in only a small portion of your money if you would like to jump gun. Today's rise is purely speculation. And I would say, unless Ben Bernanke gives any hints on potential QE3, we should still remain cautious. Sure, there may be some missed opportunities of buying stocks at the bottom if market rallys after 2moro Ben's talk. But being a trader, we need to think of the worst scenario. If there aren't any assurances from Ben, the market might swing the opposite direction. The time is still early before we confirm whether the trend has changed. In fact today at 7pm Eastern time, 7am 2moro Singapore time, one of Fed's influential member Yellen will deliver his speech also. All eyes will be focused on him before 2moro's Ben talk. Let us wait and listen carefully. I know that some of us Singaporeans have take a chance to jump in onboard the ship to acquire some Singapore stocks recently. 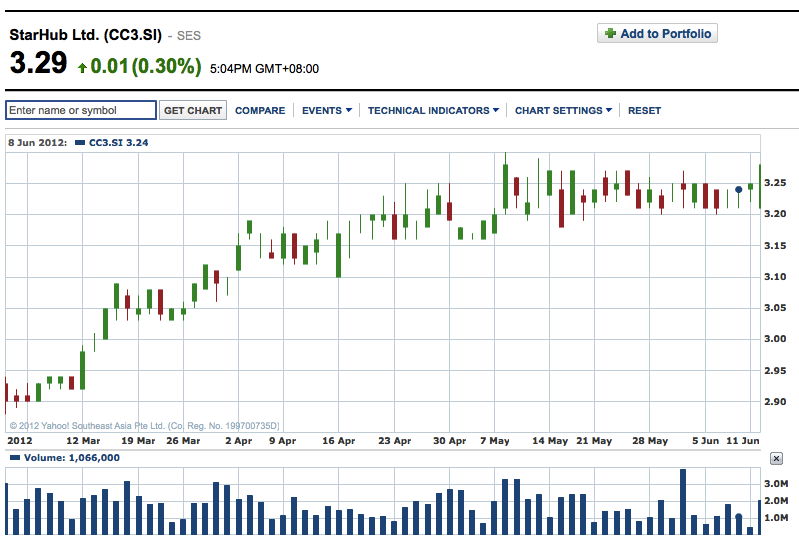 Today STI goes up 13 points. The stocks do seem cheap now compared to 2 months back. I am not trying to discourage you from entering but I would suggest if you enter, remember not to enter much. Do cut down on your position size, meaning go in a bit only. It is better to have some cash at hand now. If your stock continues to drop, you can buy again at a lower price. June is not a month where market is working for you based on the bad economical reports. Currently I would like to hear better news from Europe and US for me to really jump in big on stocks. Europe needs to give more assurance of Greece or Eurobonds. US need goverment stimulus or QE3 to really beat the bad economical news in June. If there are no such positive news from either countries, I would only go in small even if I enter. 1) Dow jones need to close higher by more than 100 points (a triple digit figure) to signify confidence. 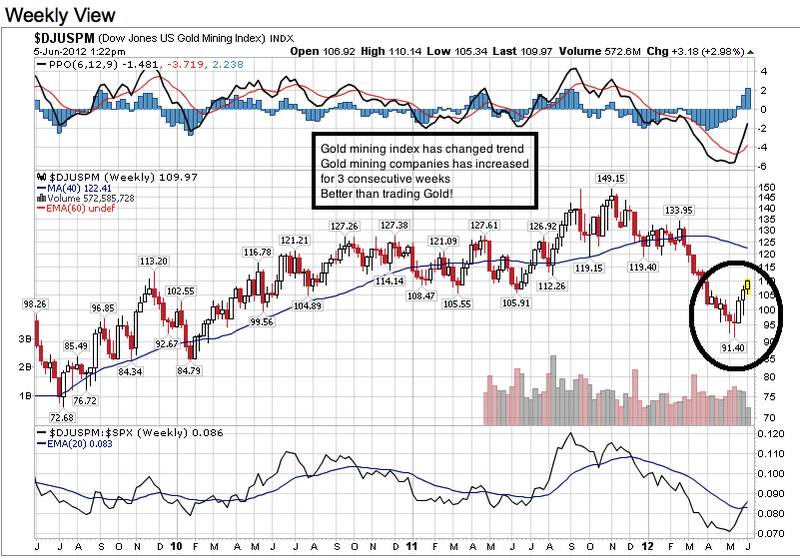 We have noticed for 3 consecutive weeks that the Gold mining index has outperformed the Gold index. Gold mining index measures the Gold mining company prices. It has been 3 weeks up! We have seen that the trend has changed for Gold mining companies. This may be the start. For the last couple of years, the gold mining companies has been underperforming the Gold price. I would suggest if you like to purchase some bullish stocks, look at companies like Goldcorp (GG), Newmont Corp (NEM), Randgold (GOLD). They are going up and up these 3 weeks. They may be better hedges than Gold price and other stocks. Look at this GOLD MINING SECTOR!!! Seems like Gold, or Gold ETF "GLD" is consolidating these 2 days, after its great rise on Fri 1 June when the Jobs report comes up. Looks likely to advance as it seems not to decrease a lot. Volume suggests accumulation. If it breaks and close above, may rise further. (Energy Sector has changed sentiment to bearish again after going bullish) This shows that last week's Non farm has such a strong impact on energy stocks. But I am anticipating a bullish alert again. I am reluctant to say this but apparently after the disastrous Jobs report and the poor ISM report, June is a month where we need to be EXTRA careful. If your stop loss is reached, we encourage you to cut your loss. If you do not wish to cut your losing positions, the following are some strategies you might consider in June. 1) Treat any upside with doubt. This is a volatile month. Grab any opportunities to be on the bearish side. 2) Consider doing some hedging against your bullish position if you are still holding to some stocks. One good way would be to short a weak stock while longing a strong one. This is called pair hedging. In a weak day, the weak stock will go down more than strong one. In a strong day, the strong one will increase more than the weak one. 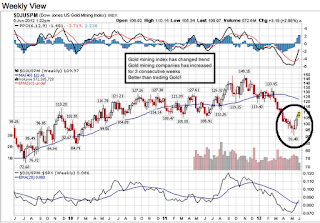 3) Consider buying some commodites like GOLD and SILVER as there is anticipation of QE3. GOLD is now an alternative currency and may be a safe haven. 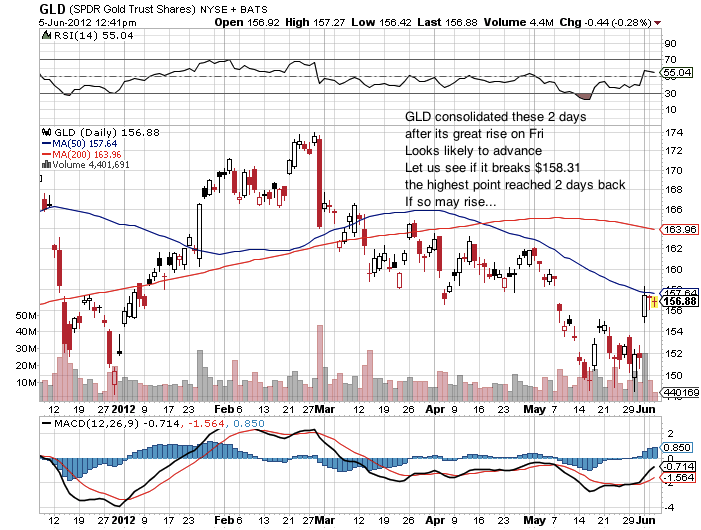 May consider buying GOLD ETF "GLD" or SILVER ETF "SLV". 4) Consider taking a look at Defensive sector stocks like utilities companies. ie. Duke Energy (DUK) or Southern Energy (SO). They hit new high on Friday. You may buy them to hedge against more offensive stocks. 5) Try not to hold any bullish positions overnight as there are risks. Day trade more often. 6) If you would like to buy cheap stocks and hold for long term, make sure you divide your capital for each stock into 3 portions. Buy with only 1/3 of your capital allocated. When price of stock goes down by 1/3, buy again. Plan your average down position and price at the start. 7) Pay attention to any money printing hints from Europe and US now. Let us see if Ben Bernanke announce any hints on printing money on 19th June FOMC meeting. 8) Try to cut down on your overall position size when entering. Where is the likely support of US Dow Jones and STI? It is a GOLD play because market thinks there might be QE3! Today we held a great Live trading session with our graduates. We together have spotted the rise in Gold price and Gold mining companies' prices because of the weak Jobs Reports! It was a disastrous report. Yesterday I mentioned that today's ISM may be bad, and I really worry about Jobs report. Today the result is still beyond my surprise. Non farm payroll report figure is 69,000 compared to the estimate of 151,000, a SHORTFALL of more than 50%!!! Unemployment rate increase to 8.2% compared to estimate of 8.1%. ISM report is 53.5% compared to estimate of 54%. I would say this is a disastrous result. It smacks the FED right in the face. That is the very reason why today GOLD price shoots straight up. 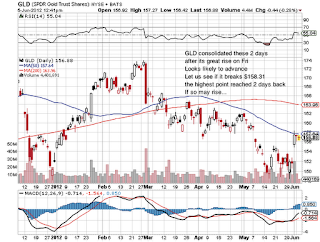 I am long on symbol: "GLD" (Gold's ETF) at this point. Wall street whisper is that there might be government stimulus. Especially the FOMC meeting on 19th June. I do not know if it is a coincidence that Greece election happens to be on the 17th June. Let us listen carefully to what Big BEN say. If he mention any hint about QE3, GOLD and Stock price will fly. In the meantime stocks will remain volatile. More selling would likely continue in June. There may be continuous worry till the Greece election. I have been waiting on the sidelines watching this stock. I am amazed at how many people that got upset with the stock. There are even reports that Facebook CEO Mark Zuckerberg and Morgan Stanley are facing lawsuits. We have mentioned before its IPO not to enter as this is an overhyped stock. I have seen exactly the same thing about VISA IPO and Baidu IPO. These 2 are great companies too! VISA had the largest IPO in history and Baidu is touted to be the Google in China. Both companies after their IPO day, did not do well after that. It takes a few months for them to get back to their feet again. Of course after proving themselves in their Earnings results, their stock price starts to increase. 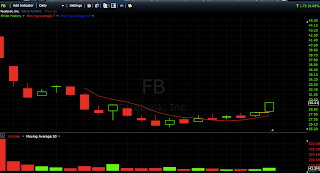 For Facebook, I stated to let this company go bust first. Indeed it has. It dropped from $42 at opening IPO, to now $26.83 the lowest yesterday, a drop of 36% in 9 short days. But apparently, yesterday is the first day I saw some life in this company. By 2pm, it suddenly turned up. See the last few minutes? It closed at the highest. 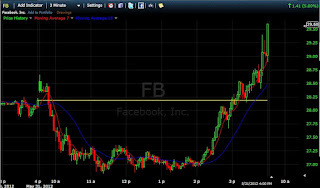 No doubt, today this stock has a high chance to continue its climb. 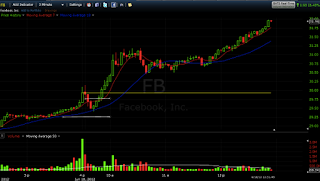 It might even gap up at open.Volume is high at closing. I have little doubt that that APPLE looks strong. She is waiting to burst through $580, which seems to be small resistance now. It is only a matter of time that she break through. I mentioned that $580 is the last barrier for it to fly. Today it opens high at $581 before collapsing to $571. Now it is back to $579. Can't break through convincingly yet. I thought that it has a chance of gapping up today, but it didn't as the economical reports did deter it from flying today. Like I say, this maiden APPLE flight may be deterred if Friday reports are not good. So we have to see how the reports are 2moro. Yesterday one of the most respected hedge fund manager, David Einhorn, in Wall street commented on Apple, publicly gives his blessing to APPLE. David Einhorn thinks it is one of the most undervalued stocks in US and provided his reasons. By the way David Einhorn is a know shortist. He likes to study the fundamentals of stocks, and short those that could not justify its valuation. He has received extensive coverage in the financial press for short selling Allied Capital, Lehman Brothers and Green Mountain Coffee Roasters stock. Just one word from him, stocks can go down 20-30% in one day. Recently Herballife suffered a 30% decline in one day because of this guy too. The thing is if David Einhorn gets his name behind this stock, I think we should too! Fundamentally it is so undervalued now. US Economical Reports today are bad, but Dow Amazingly climb back to Green! I am totally surprised at how Dow came back today to green colour by mid day. It has been an amazing turnaround. Look at below results for the details of the reports. 1) ADP employment report which measures private sector jobs is less than expectation. 133k to the forecast of 145k. 2) Unemployment claims which indicates how many people are jobless and go to government for help is more than forecast 383k compared to forecast of 369k. 3) Chicago PMI a private report which measures how enterprise are doing shows a disastrous 52.7% compared to 56.7% forecast. All 3 are bad and yet Dow Jones came back. It is really interesting to see how market reacts 2moro to ISM and Non-farm payroll. Judging from today's play, market seems reluctant to drop amid the bad reports. It seems to suggest that it has dropped too much already. However I am worried about 2moro ISM and non-farm payroll report. I know ISM may be bad, and employment report seems a close call now. So my strategy probably is not to hold overnight position as I think there are risks that 2moro if the reports are not that good, it might open lower. However I also feel that , if 2moro Dow opens lower, there may be a chance for it to come back just like today. Not that easy a market to predict and trade now. Remember if Dow can rise for 3 consecutive days, it would indicate a short term bullish change in trend.